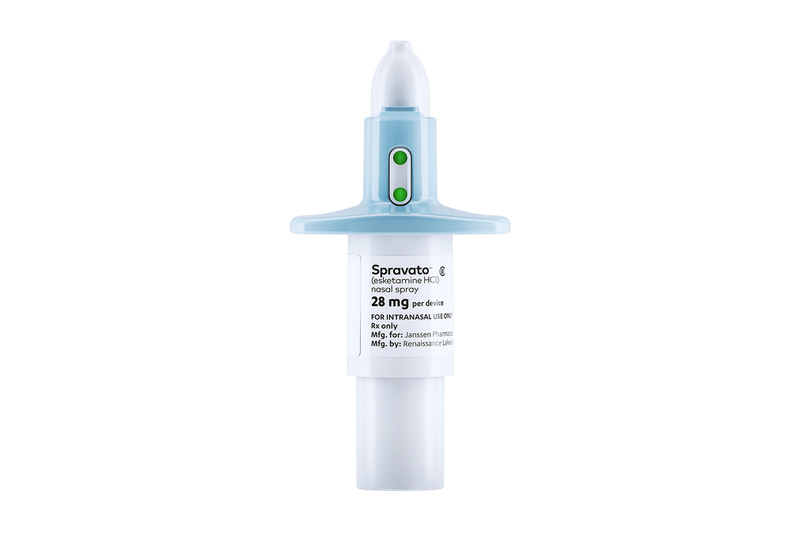 Ketamine-Derived Drug Spravato For Major Depression Gets FDA Approval : Shots - Health News Three decades after Prozac arrived, consumers are getting a new kind of antidepressant. The medicine is based on the anesthetic ketamine, which has been used illicitly as a party drug. 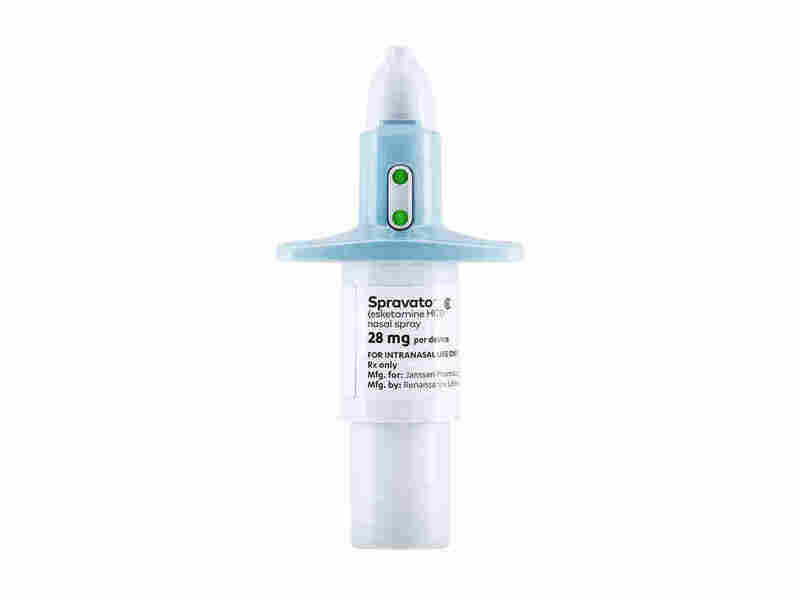 Spravato, the brand name for esketamine, a newly approved option for treatment-resistant depression. Editor's note, March 6, 9:30 a.m.: This story was updated to include information about the price of Spravato. The FDA's decision came Tuesday, less than a month after a panel of experts advising the agency voted overwhelmingly in favor of approval. "There has been a long-standing need for additional effective treatments for treatment-resistant depression, a serious and life-threatening condition," said Dr. Tiffany Farchione, acting director of the Division of Psychiatry Products in the FDA's Center for Drug Evaluation and Research, in a press release about the decision. "This is potentially a game changer for millions of people," said Dr. Dennis Charney, dean of the Icahn School of Medicine at Mount Sinai in New York. "It offers a lot of hope." Esketamine works through a mechanism different from those of drugs like Prozac, Charney said. And that is probably why studies show it can often help people with major depressive disorder who haven't been helped by other drugs. "Many of them are suicidal," Charney said. "So it's essentially a deadly disease when you haven't responded to available treatments and you've been suffering for years if not decades." "Spravato will not be dispensed directly to a patient to take at home," he said. "It will only be available in approved and certified treatment centers." "The amount of active ingredient that's in this product, it's at a very, very low dose," Billington said. Even so, the FDA, according to its press release, is requiring a warning label that says patients "are at risk for sedation and difficulty with attention, judgment and thinking (dissociation), abuse and misuse, and suicidal thoughts and behaviors after administration of the drug,"
Esketamine's approval comes as more and more doctors have begun administering a generic version of ketamine for depression. Generic ketamine is approved as an anesthetic, not as an antidepressant. Even so, doctors can legally prescribe it for off-label medical uses. And as a growing number of studies have shown ketamine's effectiveness against depression, ketamine clinics have sprung up around the United States. These clinics often administer the drug in an intravenous infusion that can cost more than $500 per treatment. Many doctors who have become comfortable offering ketamine for depression probably won't switch to esketamine, said Dr. Demitri Papolos, director of research for the Juvenile Bipolar Research Foundation and a clinical associate professor at Albert Einstein College of Medicine. "I'm very pleased that finally the FDA has approved a form of ketamine for treatment-resistant mood disorders," Papolos said. He said the approval legitimizes the approach he and other doctors have been taking. But he hopes that doctors who are currently using ketamine continue to do so. "It'll be a lot less expensive and a lot easier for their patients [than esketamine]," he said. Esketamine "may not be as effective as a generic that any psychiatrist or physician can prescribe without restrictions," Papolos said. Johnson & Johnson said the wholesale cost of each treatment with esketamine will range from $590 to $885, depending on the dose. That means twice-weekly treatments during the first month will cost centers that offer the drug at least $4,720 to $6,785. Subsequent weekly treatments will cost about half as much. The drugmaker says those figures don't include administration and observation costs.